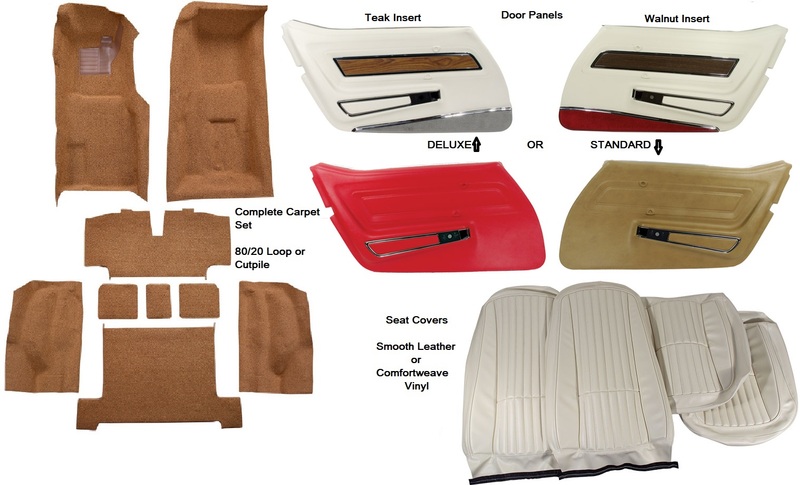 Kit includes Door Panels, Seat Covers , Seat Cover Install Kit, and a Complete Carpet Kit in 80/20 Loop or Cutpile. Standard Door Panels arrive with professionally installed Armrest U-Trim, Lock Knob Insert Plate, and Upper Door Panel Felt. Deluxe Door Panels arrive ready to go with installed Walnut or Teak Insert, Upper Door Panel Felt, Armrest U-Trim, Lock Knob Insert Plate, Chrome Trim Strip and Carpet/Vinyl Strip. 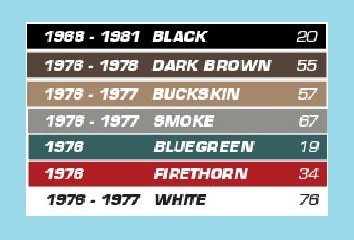 Seat Covers in Smooth Leather for Deluxe Interior, or Smooth Vinyl for Standard Interior. Seat Covers are also available for the Deluxe Interior in Leather-Like (Smooth Vinyl), but were not originally used by GM.